The Children’s Cricket Charity ensures the endless supply of superseded new and used cricket gear in pockets of Sydney is diverted from landfill and redistributed to disadvantaged cricket-loving communities. 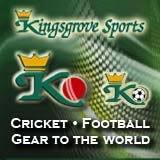 This fundraising round assists delivering literally container loads of cricket equipment continually collected, stored, cleaned and repacked into kit bags for needy primary and secondary school aged children across both NSW and the Caribbean. Thank you in advance for coming together as a community and participating in the NSJCA CRICKET KINDNESS CHARITY ROUND to help make the round a success.